Getting your oil changed regularly is one of the smallest, but most important things you can do to keep your vehicle running properly and prolong its life. Elite Auto Centre's Service Department is known for quick, efficient oil changes on virtually all makes and models of vehicles. Don't trust your car, truck, van, or SUV to just anyone, get your oil changed with the trusted pros here at Elite Auto Centre. "... the oil in an engine acts not only as a lubricant, but as a cooling agent and a method of pulling nasty minute and possibly damaging particles caused by wear into the filter and boiling off harmful chemicals caused by combustion. Those particles or chemicals might remain in the oil of a lightly used engine. As well, oils and other fluids can break down over a period of time, losing their effectiveness." "...don't underestimate the value of having a trained individual under the hood of your car. They will be able to spot a number of trouble situations that, if left untreated, have the potential to cause a breakdown. They should be looking for fluid leakage, cracked or frayed belts, bulging hoses and safety items including torn wiper blades, burned out lights, and unsafe tires. The success of this approach only works if you have found a shop that distinguishes true customer need from sales effort." There is an endless selection of motor oils available, but they are not all created equal. Quality oils have additives to help viscosity and prevent sludge build-up in the engine. Many will also have retardants added to limit corrosion. Make sure you have quality oil in your vehicle. 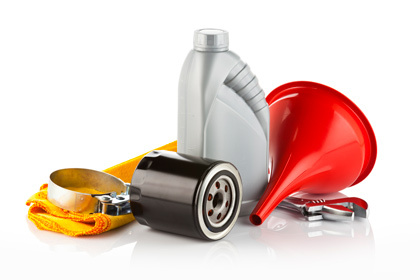 Elite Auto Centre has access to more than 30 brands of motor oil, so you know we have the right one for your vehicle. Five per cent of accidents are due to poor vehicle maintenance. Regular maintenance helps ensure your vehicle is in top working order. Oil prevents wear and friction between the various moving parts in your engine. As older oil breaks down, it isn't as effective at doing its job which can mean wear and stress on your engine; over time, this can take have a negative effect on your vehicle's performance and engine life. New oil allows your engine parts to move freely which means your vehicle doesn't have to work as hard. As engine oil breaks down, your engine must work harder, needing to use more fuel to get the performance you expect from your vehicle. 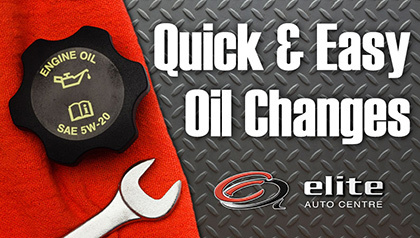 Join our oil change program and for a very affordable one-time flat rate you receive an Oil Change Card. Use this card to redeem as many oil changes your vehicle needs within the year. This is a LIMITED TIME offer! Join now for just $399 for gas vehicles, $599 for synthetic oil, and $599 for diesel vehicles and take advantage of these incredible savings.